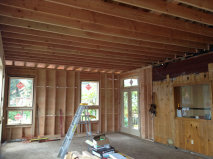 Charlette contacted me about building a transom for a new large room addition to her home in Sandyston, New Jersey. 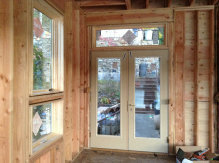 To the right are photos of this addition showing the premade transom ready to accept a new stained glass transom. Charlette sent a photo of an ornate Victorian transom with some design features she liked. Being an early Victorian transom (probably American Midwest 1860 - 1880) the flowers and lines are somewhat simplistic.... so we thought we could modify it by adding more curves as in later stained glass transoms. Charlette's home backs up to a lake, so water lilies and dragonflies are a common sight. She wanted to try to work those features into our drawing as a focal point. Her window opening was much longer than the original, so we had to redraw longer and were able to incorporate the water scene under the arch. Charlette sent a picture (above) of a water lily she liked. Charlette also sent a picture (above) of a dragonfly she liked. I modified the dragonfly wings to be more like the real dragonfly above. It is really great to have a client who is so creative and wants to be involved in the design process. This really helps me focus in on the perfect design to meet their expectations. To pick glass colors for this transom I sent Charlette a full size pattern and a sample box with hundreds of glass samples. She sent me back a list with every glass piece noted with its selected color. 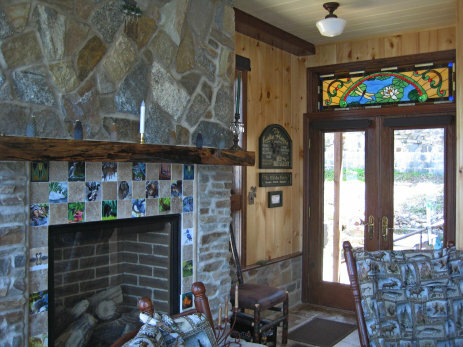 After the transom was finished Charlette wrote me back saying "They (customers) might also like to know that your sending me the box of glass samples led to my being able to find the exact colors I wanted, a major advantage in going custom". This is one of the most challenging pieces I have ever built. 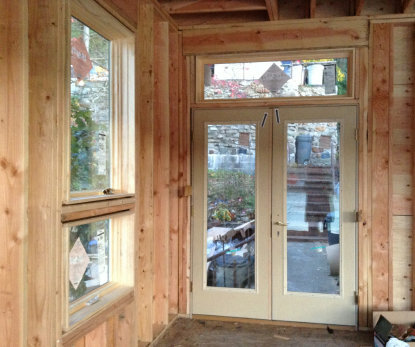 The transom contains 203 pieces of glass plus the 46 red glass globs. Each of the globs was a different size and had to be individually fit into the background around it. I've been building glass for 35 years and every so often I get to do a project like this that pushes the limits of my skills. Its also exciting to work with a person like Charlette who knows what she wants and jumped right into the design process with ideas and suggestions. Charlette's Transom measures approximately 17" x 58" and was finished in February, 2015. It is enjoying its new home overlooking the lake in Sandyston, New Jersey. 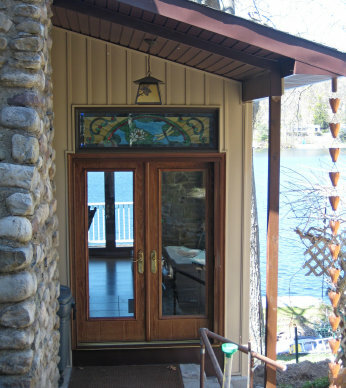 An exterior view of Charlette's Transom installed. What a beautiful lakeside setting! After several consultations, we evolved the drawing above. We kept the basic concept of the original glass but added the lake related features that Charlette wanted .....and created a much more graceful design. Charlette was gracious enough to send me some pictures of her new addition after her new transom was installed. What a magnificent room addition!